Young Europeans in Finland and Greece debate policy initiatives to create a resilient and innovative Europe. Policy ideas for the better integration of refugees and to promote an app to help young Europeans address the challenge of social exclusion were the winning proposals selected by juries in Finland and Greece. The jurors were assessing the work of 17 teams participating in ‘Why Europe Matters’ workshops. 80 young people from 6 schools participated. Their discussions were guided by mentors from leading European companies. 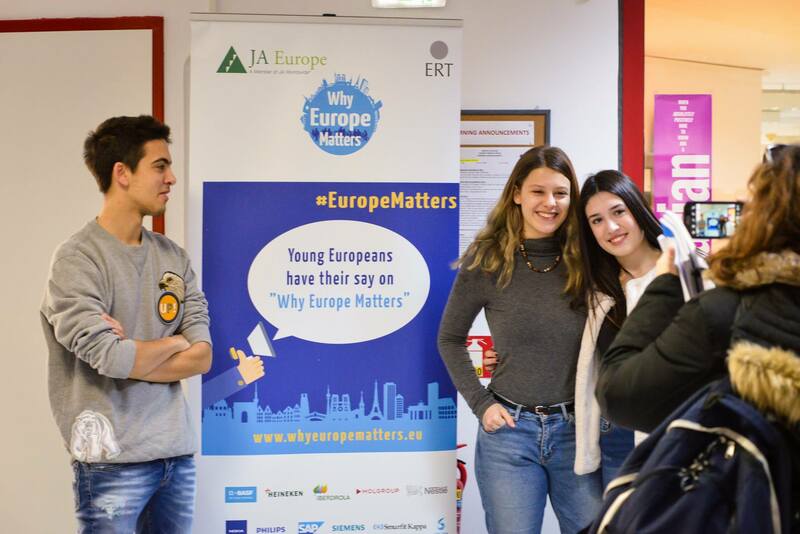 The workshops, held at Finland’s University of Oulu and at Anatolia College in Thessaloniki, are part of the ‘Why Europe Matters’ campaign facilitated by JA Europe and the European Round Table of Industrialists. The idea behind the campaign is simple. Connect European Union decision-makers with young Europeans. Show young people that Europe matters to them now and encourage them to come up with ideas about the ways in which Europe can improve their futures. Make it clear that young people can make concrete contributions to policymaking. Create an event at which winning workshop participants present their best policy ideas to decision-makers. Each of the teams was encouraged to choose one of the four themes from last May’s Rome Declaration. These were a safe and secure Europe, a prosperous and sustainable Europe, a social Europe, and a stronger Europe on the global scene. None chose the last of these and ‘social Europe’ proved the most popular. To an extent the workshops mirrored current issues of concern in the countries holding them: nothing surprising in that. In Greece two policy proposals were concerned with refugees. Both were determined to be constructive, considering how migrants might best be integrated with their host communities. Workshop participants in Finland had a particular interest in environmental issues. They wanted to see more energy being generated from renewable sources. They also had ideas about a European fund to support companies committing to renewable energy. But the workshops also threw up unexpected ideas. The ‘girl power’ team in Oulu suggested a programme allowing young Europeans and their teachers to help the recovery of crisis-struck developing countries. Alongside them a team of ‘future influencers’ wanted not only to educate young people about minorities but also to provide opportunities for work with them. And in Thessaloniki one workshop wanted to see citizens who were high performing recyclers rewarded by exemptions from local taxation. ‘Why Europe Matters’ has a programme of workshops in nine Member States. Finland and Greece are numbers six and seven. Next up are France and Germany. And in March this phase of the campaign concludes with a major event in Brussels. The workshops to date have generated a wide range of policy proposals. Some are familiar; others are new. Some are ready for implementation; others less so. But they all have one thing in common. They share the fact that they come from young Europeans keen to contribute to the creation of a resilient and innovative Europe. As the European Round Table’s Brian Ager points out: “Europe’s youth has an important role to play.” In these workshops we see them doing just that.